Gotta love aprons! They are fast to sew, really cute, make you feel like you are in some kind of 50’s sitcom, and if you cook anything like me really do save your clothes from the pasta sauce. I checked out Liberty of London Home Sewing from the library a while back and fell in love with this apron. I decided it was time to make a new one for me. As a disclaimer in advance I did not use the Liberty of London’s fabric, despite how gorgeous they are and I drool over them every time I am at the fabric store, I won’t spend $35 a yard. 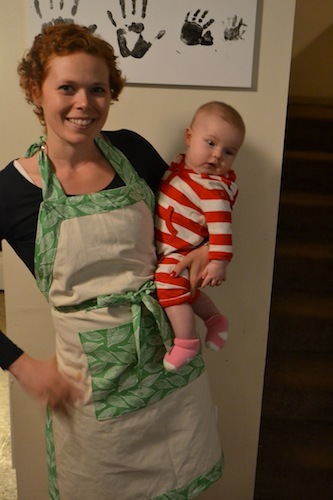 The apron was pretty easy to make, despite the crappy instructions. I did make a couple small tweaks, just some extra top stitching on both edges instead of just the outside and made the corners diagonal seams instead if the prescribed straight across. All for visual reasons not pattern/construction reasons. For the main cream panel I use a light weight canvas, and the green print is just a simple quilters cotton that I found on sale. I shop the clearance section at the fabric stores too! The apron is nice and long, a little too long for me at 5’4″ but anyone not quite this short it would be great. I end up folding it slightly when I where it, nothing worth getting the seam ripper out for though. The colored panel on the front is meant to just be a hand wipey thingy, but I decided to make it a pocket. Still works great to wipe my hands on! 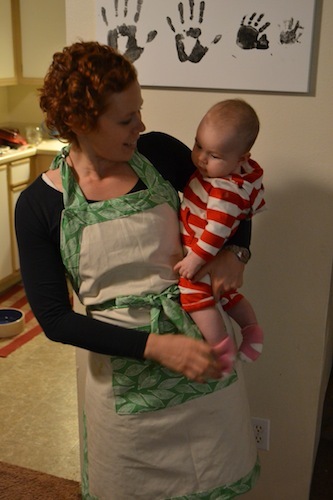 I really like this apron, it gets worn daily, and I am considering making a second of the holidays! This would also be a great gift too if you are stumped for that special cook!